BEIJING: China has been engaged in a flurry of efforts to help Haitians and Chinese nationals after the Caribbean island country Haiti was battered by a devastating earthquake on Tuesday. 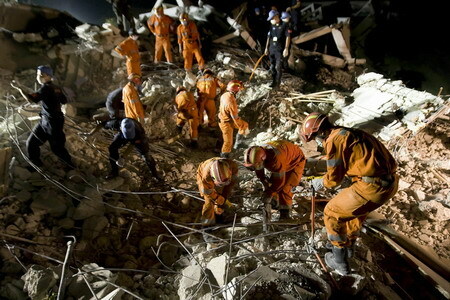 Immediately after the quake was reported, Chinese President Hu Jintao and Premier Wen Jiabao ordered related Chinese departments to be prepared for assistance. On Wednesday, a Chinese emergency rescue team made up of 60 members was dispatched to Haiti, where they went all out to look for traces of lives as soon as they reached the debris of the UN headquarters. The Chinese team set up on Friday a medical assistance station, the first one by a foreign rescue team. The station not only provided medical treatment to the injured, but also tried to improve the local people's awareness of and knowledge about epidemic prevention. A team member told Xinhua that local people believe that the medical assistance the Chinese rescuers are giving is desperately needed. On Saturday night, a Boeing-747 jumbo jet carrying 90 tonnes of emergency humanitarian aid provided by the Chinese government took off from Beijing Capital International Airport for Haiti. The relief supplies, worth 13 million yuan (US$1.9 million), included tents, stretchers, food, medicines, clothing and water purification equipment. The aid was the first batch of a 30-million-yuan (US$4.41-million) relief package announced by the Chinese government Friday. The supplies were prepared within 24 hours after the government decided to provide emergency aid for Haiti. China's Red Cross Society has also pledged 1 million dollars in emergency aid. In response to the UN flash appeal for Haiti on Friday, Liu Zhenmin, deputy Chinese permanent representative to the UN, said "the Chinese government will closely follow the developments of the disaster in Haiti" and "will do what it can to provide assistance and contribute to the efforts of the Haitian people to triumph over the disaster and rebuild their homes at an early date." The bodies of all eight Chinese police officers who were buried in the debris of a UN building were discovered as of late Saturday local time. They were having a meeting with Hedi Annabi, head of the UN Stability Mission in Haiti (MINUSTAH), when the strong quake destroyed the building. Annabi's body was discovered by Chinese rescuers shortly after noon in the day. "The eight comrades who sacrificed their lives during the Haiti quake are outstanding representatives of the 2 million Chinese police force members ... They are the models for public security departments across the country to learn from," said a statement of the Chinese Public Security Ministry. Before the quake, a total of 142 Chinese police officers were deployed in Haiti as part of the UN peacekeeping mission.